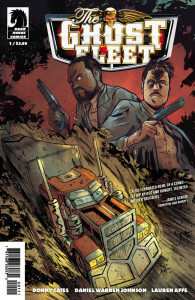 Pullbox Reviews: Ghost Fleet #1- Keep on Truckin’! For the world’s most valuable, dangerous, or secretive cargo, you don’t call just any trucking service . . . You call THE GHOST FLEET. When one of the world’s most elite combat-trained truckers takes a forbidden peek at his payload, he uncovers a conspiracy that will change his life forever! A new series of badass action on the open road begins here! * From the critically acclaimed writer of Buzzkill! Okay, that might be going a little thick, but this is a new title that got me a little excited. I’m kind of an action guy… Love action. Movies, books, comics, it’s all kind of my thing. So when I get a peek at a story that gives me the action I crave, and does it with great writing and three dimensional characters, I get a little excitable. This issue did all of that for me. At first I wasn’t sure how I was going to take to this book. It starts out with a tease, then gives us a few pages of dialogue as we’re introduced to our characters.